Matching LILY shoes, BELFAST bag and COMO purse. Dainty and sweet, low-heeled LILY features a pretty beaded bow detail. Perfect for any special summer occasion, Ruby Shoo LILY matches perfectly to bag style BELFAST. Perfect for your special day. Upper: Textile Lining: Synthetic Sock: Textile Sole: Man made materials Heel Height:60mm. New mini-briefcase BELFAST bag is a practical but elegant bag with carrying handle and removable shoulder strap. BAG Outer: Textile Lining: Textile Width: 230mm Height:160mm Depth: 80mm Strap length: 1230mm Strap Drop:610mmAn exciting new addition this season, Ruby Shoo have also created this adorable matching purse. With fold over front, lots of pockets and zip compartment, and feature buckle the COMO is practical as well as cute. 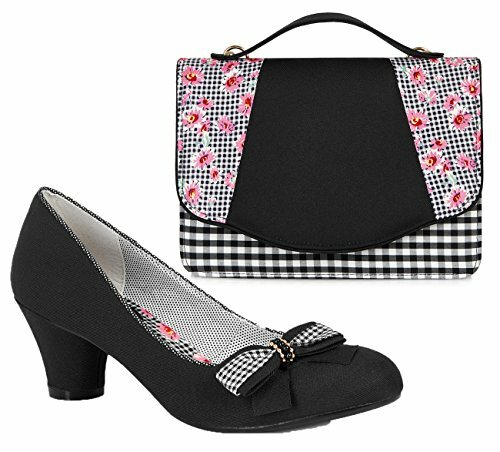 Matching LILY shoes, BELFAST bag and COMO purse. Dainty and sweet, low-heeled LILY features a pretty beaded bow detail. Perfect for any special summer occasion, Ruby Shoo LILY matches perfectly to bag style BELFAST. Perfect for your special day. Upper: Textile Lining: Synthetic Sock: Textile Sole: Man made materials Heel Height:60mm. New mini-briefcase BELFAST bag is a practical but elegant bag with carrying handle and removable shoulder strap. BAG Outer: Textile Lining: Textile Width: 230mm Height:160mm Depth: 80mm Strap length: 1230mm Strap Drop:610mmAn exciting new addition this season, Ruby Shoo have also created this adorable matching purse. With fold over front, lots of pockets and zip compartment, and feature buckle the COMO is practical as well as cute.